The Cyclo Polisher is the world’s premier orbital polisher for one reason: it’s the only polisher with patented dual orbital heads! The Cyclo Polisher received the patent on their design in 1953 and quickly became the U.S. government’s choice for polishing military aircraft and missiles. Why? Because two heads are better than one! The two heads of the Cyclo Polisher move in an overlapping, circular motion. The heads are designed to mimic the motion of hand polishing, but much faster. Both heads spin counter-clockwise and produce an overlapping effect. The design eliminates the problem of overheating so there’s less risk of gouges, burns, or swirls. In addition, the Cyclo Polisher is perfectly balanced for a perfect polish every time. Some 50-year-old Cyclos are still in use today! Not only are they built to last indefinitely, people see no need to replace them. For polishing, compounding, sanding, stripping, scrubbing, and buffing, there’s only one Cyclo Polisher! To learn more about this innovative machine, click on Cyclo Polisher below. 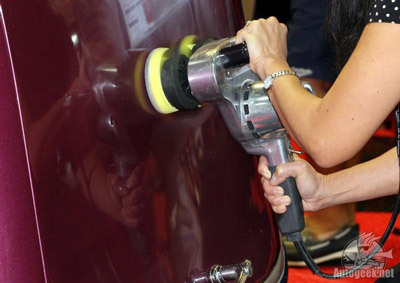 The Cyclo polisher is smooth and easy to operate - even for beginners! AutoGeek is a trusted name for carrying quality products. They also carry a wide selection of products, so the choices are many. I appreciated the car care articles on their website, which helped me to decide on the right products for my cars. I received my shipment on time, and the items were packed with care. First time I've ever ordered anything from Auto Geek. Won't be the last- I ordered the Cyclo Orbital polisher, and it was the best price I found. Even better was the free attachment offer. I'm glad to know I can order the pads from Auto Geek when I need replacements. Quick shipping, too. I'm impressed, and I don't impress easily.